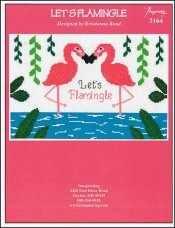 Let's Flamingle [H1888] - $6.00 : Yarn Tree, Your wholesale source for cross stitch supplies. Cross stitch chart from Imaginating. Designed by Kristianna Bond. Look at these two love birds! The two flamingos are enjoying a nice summer day in the water! "Let's Flamingle," is stitched underneath the two flamingos standing in the water. Looking for a conversation piece for your beach home? "Let's Flamingle," might be the one! Stitch count 150v x 100h. Stitched on #2936 Zweigart Aida 14ct White (59" wide) or #8221 Zweigart Aida 14ct White (43" wide).